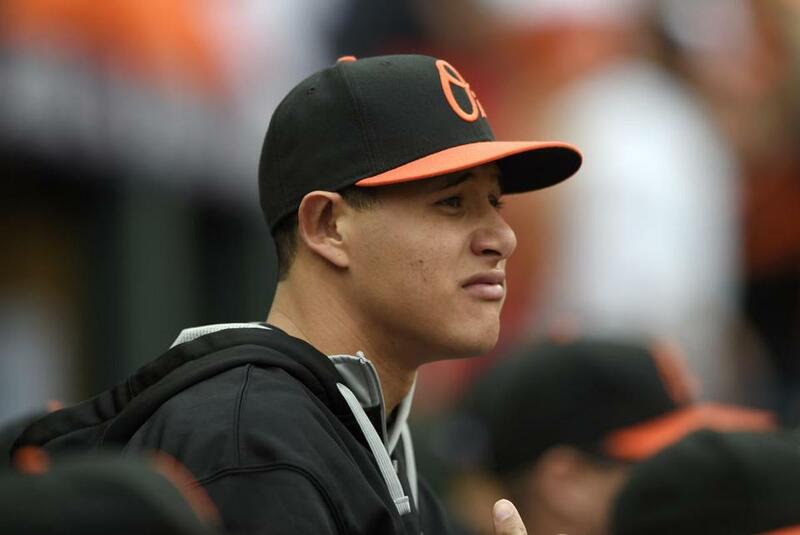 The Orioles will benefit from the return of third baseman Manny Machado, who missed much of last season after having knee surgery. As January nears, has any AL East team separated itself from the pack? Improvement? Certainly. The Red Sox, Blue Jays, and possibly the Rays (through injured players returning) have improved. It’s hard to get a feel for the Yankees, whose goal was to get younger in the middle infield and in the rotation. 1. Orioles — They lost Nelson Cruz (to Seattle) and his 40 homers, Nick Markakis’s solid defense in right, and reliever Andrew Miller, but are they any worse for wear? They played so much of last season without their trio of Chris Davis (127 games), Matt Wieters (26 games) and Manny Machado (82 games) and still won the division. So they’re not panicking about replacing Cruz and Markakis. A look at two long playoff droughts for the Yankees. They’re banking on Davis, entering his free agent year, getting his act together off a 25-game suspension for testing positive for Adderall. Davis hit .196 with 26 homers and 72 RBIs in 2014 after he hit 53 homers and knocked in 138 in 2013. Wieters is coming off Tommy John surgery, but agent Scott Boras said he’ll be ready by Opening Day. Wieters also is in his walk season. Machado, who had knee surgery, is expected to continue his All-Star defensive play at third and should keep emerging as an offensive weapon. The Orioles rotation (67-45 with a 3.63 ERA in 2014) is top notch. You can argue whether Chris Tillman is an ace, but he’s a solid No. 2 and a rotation with Bud Norris, Miguel Gonzalez, Wei-Yin Chen, and Kevin Gausman — with Ubaldo Jimenez trying to come back from a poor year and Dylan Bundy on the verge — isn’t bad. To do: David Lough is a possible replacement in right, but preferably he’d be an extra player. The Orioles, who also have Steve Pearce to utilize, have to come up with another bat at DH or right field. There still are teams with excess outfielders such as Allen Craig, Shane Victorino, Carlos Quentin, Seth Smith, Andre Ethier. The Orioles saved money on Cruz and Markakis and should have enough to make it happen. 2. Red Sox — Ben Cherington has proven to be a fixer of disasters and he did a nice job of cleaning it up after the 69-win 2012 season. Now he’s faced with the same predicament after a 71-win season. Cherington has revamped the offense with Pablo Sandoval and Hanley Ramirez. There is no position weakness unless Xander Bogaerts fails to handle shortstop or Rusney Castillo doesn’t live up to his paycheck. Boston’s new rotation will be the focus. Gone are Jon Lester, John Lackey, Jake Peavy, and Felix Doubront from last season. Cherington brought in younger up-and-coming pitchers such as 15-game winner Rick Porcello and lefty Wade Miley, and reclamation project Justin Masterson. The hope is that Joe Kelly emerges as a top-of-the-rotation starter and extends his innings pitched over his high of 124, and that Clay Buchholz, who has had brilliant stretches in his career and horrible ones, finds consistency. To do: Find an ace. The Red Sox have no excuse for leaving themselves short in this area. They have player and financial resources to obtain free agents such as Max Scherzer or James Shields, and trade for Cole Hamels, David Price, or Jordan Zimmermann. John Henry said the team can go over the $189 million luxury tax threshold for a year. And they need another lefty in the bullpen. Projection: With an ace — 84-88 wins. 3. Blue Jays — The Jays did a nice job revamping their offense by obtaining third baseman Josh Donaldson from Oakland and signing catcher Russell Martin, who should help some of Toronto’s young pitchers. The Jays have a similar issue as Boston — absence of an ace. They have two innings-eaters in Mark Buehrle and R.A. Dickey; rising youngsters in Marcus Stroman and Drew Hutchison, and Aaron Sanchez, who has top-of-the-rotation type stuff. Not sure anyone’s sold on Brett Cecil as the closer or Justin Smoak as the first baseman. To do: They are short at the top of the rotation and at closer. Rogers Communications, the team’s parent company, did allow the Martin expenditure, but you can’t go halfway in a division that’s so closely contested. 4. Yankees — The Yankees tried to get younger by acquiring 24-year-old shortstop Didi Gregorius from Arizona and 24-year-old righthander Nathan Eovaldi from Miami. They were able to secure third baseman Chase Headley on a four-year deal and lefthander Miller for four years. They hope all of their veterans — Carlos Beltran, Brian McCann, Mark Teixeira, and Alex Rodriguez — make solid comebacks from off years and/or injuries. The Yankees did not address rotation questions stemming from four injured pitchers — CC Sabathia, Ivan Nova, Masahiro Tanaka, and Michael Pineda — coming back from injuries. They let closer Dave Robertson go and are banking on free agent acquisition Miller and righthander Dellin Betances to be a shutdown tandem at the end of the bullpen. To do: A pitcher at the top of the rotation; veteran middle infield depth (especially at second base after dealing Martin Prado). 5. Rays — Nobody has lost more leadership with manager Joe Maddon and GM Andrew Friedman leaving for big paydays in Chicago and Los Angeles, respectively. The Rays will be competitive because their pitching (their 3.48 ERA was tops in the division last season) is still good. Alex Cobb, Chris Archer, Drew Smyly, Jake Odorizzi, and Matt Moore (returning by late May after Tommy John surgery) should keep the Rays afloat. Hard throwing Jake McGee will get his chance to close. The lineup is problematic, however. Desmond Jennings’s 10 homers is tops in the outfield. The Rays will have Steven Souza, a righthanded hitter with pop, acquired in their offseason deal with the Nationals, compete for their right field job after sending Wil Myers to San Diego. To do: The Rays could use another productive outfielder and/or a power bat at DH. A Quentin/Ryan Howard-type makes sense. The Padres and the Phillies would eat most of the respective contracts to make it happen. January is Max Scherzer Month. It’s when Scott Boras will find a suitor to pay Scherzer more than the Cubs paid Jon Lester (six years/$155 million) and show through any means necessary he represents the one and only true difference-maker left to be had in baseball. “Max completes any team and makes a true difference to any contending team,” Boras said. Boras is right on this one. Scherzer is the one difference-maker still in the market. If you go by Wins Above Replacement, Scherzer makes a 5-6 game difference, enough to push an 85-win team into a 90-plus win team. There’s nothing not to like about Scherzer — except for the price tag. We can start at seven years, $189 million. Is there any team out there that still has a budget to go for it in January? All it takes is for one owner to write the check. It takes one GM to convince his boss that going the extra mile for Scherzer will put them in position to win it. And there are teams like that out there. The candidates are the Nationals, Dodgers, Angels, Red Sox, Yankees, Cubs, Rangers, Astros, Cardinals, Padres, Marlins, and Tigers. The Giants say no. The Nationals can deal Jordan Zimmermann for a haul of prospects and then sign Scherzer. The Dodgers could easily do it even though Andrew Friedman wants to reduce payroll. The Angels need a front-end starter to compete with Seattle. Texas has the resources and has been quiet on the pitching front (with the exception of Ross Detwiler). The Astros have gone after a few free agents and upgraded their bullpen. Why wouldn’t they bring in an ace? The Cubs signed Lester, but if they feel they’re ready to win, Scherzer would create quite a 1-2 punch. Scherzer is from the St. Louis area, but not sure geography is enough for the Cardinals to take the plunge. The Padres are trying to be relevant and this move would do it. The Marlins also have gone all out, but not sure they can afford another huge expenditure. The Yankees have decided to control their spending, but can they afford to miss the playoffs again? The Red Sox have a similar quandary. They have done a lot of team building but lack one more piece — the ace. Boras believes the Red Sox like what Scherzer could bring them, but they would have to convince John Henry to write a huge check. As written last week in this space, a lot of executives believe he could re-sign. If the Tigers get the sense that David Price won’t re-sign, that could help Scherzer’s cause. 1. Great get by the Boston chapter of the BBWAA. Pedro Martinez will be honored as the winner of the Judge Emil Fuchs Award for long and meritorious service to baseball at the dinner Jan. 22 at the Harry Agganis Arena. Martinez is expected to be a first-ballot Hall of Famer. For tickets, call 617-624-1231. 2. Surprising that neither the Yankees nor the Red Sox landed reliever Jason Grilli. Both went into the offseason liking him as a bullpen piece. Grilli signed a two-year deal with the Braves. 3. Scott Boras has one comeback candidate client in Barry Zito. When asked if Johnny Damon could be another, even at age 41, Boras said, “If you ask Johnny, he’d love to come back.” Damon has 2,769 hits. Only 51 players in the history of baseball have more. And only 30 players have scored more runs — 1,668. 4. A few readers pointed this out: the Red Sox wouldn’t give No. 21 to Rick Porcello out of respect to Roger Clemens, who is not in the Hall of Fame yet because of steroid allegations. But No. 26 is given to anyone, and Wade Boggs is in the Hall of Fame wearing a Red Sox cap..
5. As fun as it is to pore over some sabermetric stats, batting average, home runs, and RBIs pretty much tell the story of a hitter. For a top-of-the-order speed guy, walks, on-base percentage, and stolen bases do the same. 6. Bill James projects a 2015 season for Mookie Betts at .321 with 15 homers, 41 doubles, and 40 stolen bases; Fangraphs has him at .290 with 7 homers, 21 doubles, and 18 steals. 7. Prediction: When and if Shane Victorino gets a chance to play full time again, he will have a huge impact. Victorino loves playing with a chip on his shoulder. 8. If David Ortiz has a year like he did last year, will he kick himself for signing off on option years that guarantee him a maximum of $16 million if he makes 575 plate appearances? 9. Curious to see if the soon-to-be new owners of the Pawtucket Red Sox (members of the Red Sox ownership) keep McCoy Stadium in Pawtucket or seek to build a new stadium elsewhere. 1. Dan Uggla, 2B, Washington — Smart move by Mike Rizzo signing the 34-year-old Uggla to a minor league deal. Uggla has been horrible the last couple of years and was released by the Braves. But upon further review, Uggla’s demise might have been because of an undetected concussion he played through. Uggla’s condition was confirmed by doctors this offseason. 2. Stephen Drew, SS, free agent — Scott Boras thinks the market for Drew will heat up in January after teams have exhausted trade possibilities for a middle infielder. Boras hinted that a personal/family issue may have contributed to Drew’s offensive decline last season. Boras declined to elaborate. 3. Nori Aoki, OF, free agent — Aoki remains one of the best outfield options remaining in the market. According to Baseball-Reference.com, Aoki’s three-year WAR is 7.5. The former Royals right fielder could definitely fit for a team such as Baltimore. Another is Colby Rasmus (7.3 WAR), who has some lefthanded power and can play center, but has underachieved. 4. Ben Zobrist, 2B/RF, Rays — An interesting player to look at in January as teams do their last-minute alterations. Zobrist’s game will play well in a lot of different places. He’d be a perfect Yankee, for instance. Ditto with the Orioles. The Rays have subtracted more than they’ve added. Teams inquired about Zobrist in November and December, but the Rays resisted. Is there a price they’ll accept the closer it gets to spring training? The Giants would love him in their lineup. 5. Ryan Howard, 1B, Phillies — At some point, the Phillies must come to the conclusion they have to release Howard and eat more than $60 million. GM Ruben Amaro is on record as saying the team is better off without Howard, even though he knocked in 95 runs last season. When will that point come? And will anyone take a shot if he is free? The answer, according to one GM, is yes; an American League team would use Howard as a DH. 6. Nick Swisher, 1B/OF, Indians — The Indians would like to trade him because they acquired Brandon Moss from Oakland. Tampa Bay, Toronto, Baltimore, San Diego, Milwaukee, and the Cubs (who would love to add a veteran leader), could be possible trade partners. Swisher, who has had some knee issues, has some $30 million left on his deal and the Indians might have to eat some of the money to move him. 7. Jonny Gomes, OF, free agent — Gomes could wind up with Jon Lester and David Ross with the Cubs to add some veteran presence to a young outfield. It’s been slow going in the reserve outfield market. “He’s still an effective player. He works for a team that’s on the verge and on a team like the Cubs or Astros who need a veteran presence,” said one National League GM. 8. Ryan Lavarnway, C, Orioles — The Orioles were the fourth team Lavarnway ended up with in December, when he was passed around on waivers from Boston to the Dodgers to the Cubs and now to the Orioles. Lavarnway could compete for a backup job at DH. 9. Evan Longoria, 3B, Rays — One National League GM said he inquired about Longoria, but was told the veteran third baseman, who played all 162 games last season, wasn’t available. The Rays have Longoria under contract at $11 million this year and $11.5 million next year before his extension kicks in in 2017, through 2023. From the Bill Chuck Files — “Over the last six seasons, four pitchers have allowed more hits than innings pitched in each: John Lannan, Jeff Manship, Mike Pelfrey, and Rick Porcello.”. . . “Pop quiz: Who led the majors in pop-ups in 2014? Ian Kinsler with 80.” . . . Happy birthday to Bill Hall (35), Benny Agbayani (43), Zane Smith (54), and Bill Lee (68). Nick Cafardo can be reached at cafardo@globe.com. Follow him on Twitter @nickcafardo. Material from interviews, wire services, other beat writers, and league and team sources was used in this report.